PT Garuda Indonesia (Persero) Tbk - Garuda Indonesia is the national flag carrier of Indonesia. Garuda Indonesia is a state-owned company and is majority owned by the Government of Indonesia. As of December 2016, the Government of Indonesia holds 60.5% shares in Garuda Indonesia. Other remaining shares was owned by Trans Airways (24.6%) and 14.9% remaining shares by investor and public shareholders (with ownership less than 2%). Based in Soekarno-Hatta International Airport (near Jakarta), Garuda Indonesia runs its business through 202 fleets which serves 64 domestic destination and 19 international destination (as of December 2017). Garuda Indonesia also supported by 2 strategic business units (Garuda Sentra Medika Business Unit and Garuda Cargo Business Unit) and 5 directly-owned subsidiary companies, namely PT Aero Wisata, PT Citilink Indonesia, PT Abacus Distribution Systems Indonesia, PT GMF Aero Asia and PT Aero Systems Indonesia. PT Garuda Indonesia (Persero) Tbk is a world class airline company from Indonesia. Garuda Indonesia placed 8th in the Skytrax ratings "the World's Best Airline in 2015" and named "Skytrax - World's Best Cabin Crew 2014 & 2015". According to PT Garuda Indonesia (Persero) Tbk Annual Report 2016 as cited by JobsCDC.com, Garuda Indonesia registered total operating revenues of USD 3,863.92 million in 2016 or rose slightly from USD 3,814.98 million in 2015. Referring to its annual report, Garuda Indonesia booked total comprehensive income of USD 59.17 million in 2016. This number is a 16.95% decrease from USD 71.25 million in 2015. Holds min. Bachelor Degree from reputable university with min. GPA 3.00 (4.00 scale), majoring in Industrial Engineering, Management Accounting. Holds min. Bachelor Degree from reputable university with min. GPA 3.00 (4.00 scale), majoring in Law Business. Holds min. Bachelor Degree from reputable university with min. GPA 3.00 (4.00 scale), majoring in Communication or Public Relation. Maximum age of 27 years old for Bachelor Degree aor 33 years old for Master Degree. Required experience for minimum 1 year with knowledge and experienced in related field. Willing to br placed in Soekarno-Hatta International Airport's Office Area. JobsCDC.com now available on android device. Download now on Google Play here. Please be aware of recruitment fraud. The entire stage of this selection process is free of charge. 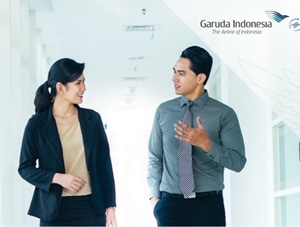 PT Garuda Indonesia (Persero) Tbk - Procurement Analyst, Legal Advisor, Communication Analyst Garuda March 2018 will never ask for fees or upfront payments for any purposes during the recruitment process such as transportation and accommodation.